The overall health of the mule deer population in the Texas Panhandle has been in decline for the past few years. In an attempt to reverse this trend, the Texas Parks and Wildlife Department (TPWD) has instituted antler restrictions for mule deer season in six Panhandle counties starting this fall. At the same time, TPWD also decided to open up a new mule deer season in Lynn County. While mule deer are having trouble in many states, TPWD biologists think that an overharvest of bucks (specifically young bucks) is a primary cause of the health problems for mule deer in the Panhandle. According to mule deer program director Shawn Gray, the mule deer herd in question has a skewed doe to buck ratio of around 5 or 6 to 1 and has too few bucks 3 ½ years of age or older. The details varied slightly from county to county under the old regulations, but most counties allowed the harvest of a single mule deer buck (defined as a deer with any hardened antler protruding through the skin) each year. However, that is changing this fall. To address these problems with the mule deer herd and reduce the harvest of young bucks, TPWD is implementing experimental antler restrictions in Briscoe, Childress, Cottle, Floyd, Hall and Motley counties. Beginning this deer season, hunters may only harvest mule deer bucks with an outside spread greater than 20" in those six counties. The antler restrictions will be in effect during both the archery and rifle seasons. How did they come up with that 20" figure? 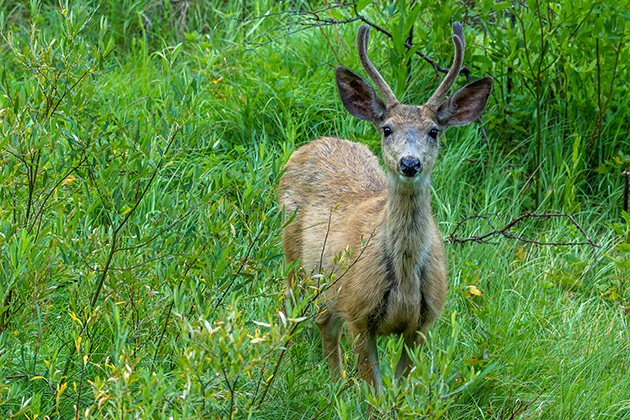 First, the average distance between the tips of a mule deer’s ears is 21". So, this gives hunters a fast way to estimate whether a buck meets that 20" threshold or not in the field. Second, TPWD biologists estimate that around 80 percent of mule deer bucks younger than 3 ½ years old in the panhandle have a spread less than 20". Conversely, approximately 80 percent of bucks between 5 ½ and 7 ½ years old have an outside spread greater than 20". By implementing these antler restrictions, TWPD officials hope to limit the harvest of young bucks and give them a chance to grow up. The idea is that this should eventually result in an increase of the number of older bucks in the mule deer population and help bring the doe to buck ratio back into balance as well. This is what happened when Texas implemented a 13" minimum spread for whitetail deer in several East Texas counties a few years ago: the buck harvest dropped initially, but the average age of bucks in the herd gradually increased over the next couple of years. If these mule deer antler restrictions have the intended effect and do indeed help improve the overall mule deer herd condition, then it’s possible that TWPD will expand the program into more Panhandle counties. Additionally, TPWD officials also decided to open up a nine-day rifle mule deer season in Lynn County. Up until this point, the county had hunting seasons for whitetail deer, but not for mule deer. At least for this year, mule deer taken in Lynn County will not be subject to the new mule deer antler restrictions. Though it may seem counterintuitive to open up a more hunting opportunities in the state with the issues mule deer are having, biologists think that opening this new season will have a minimal impact on the overall mule deer population. Recent population surveys indicate that the mule deer population in Lynn County is in much better shape than others in the state, with higher than average fawn survival rates and a buck-to-doe ratio around 2.4 to 1. As discussed in an earlier article, the TPWD commission made both of these decisions at a public hearing back in March (the same meeting they declined to lengthen the whitetail deer season at) after receiving public comment on the proposals. All told, approximately 93 percent of respondents commented in favor of the proposal to open a mule deer season in Lynn County while 84 percent were in favor of the experimental mule deer antler restrictions.